Last week wrapped up with a series of unexpected events that were related to the continuing saga of Donald Sterling and his ownership of the Los Angeles Clippers. Sterling’s estranged wife Shelly announced late Thursday night that she had signed an agreement to sell the basketball team to former Microsoft chief executive Steve Ballmer for $2 billion. On Friday, the NBA canceled a hearing to oust Sterling, which had been scheduled to take place in a few days. The league continues to move forward, however, in its voting on whether to give the go-ahead of the sale to Ballmer, who still needs to obtain the approval of three-quarters of the league’s 30 owners. 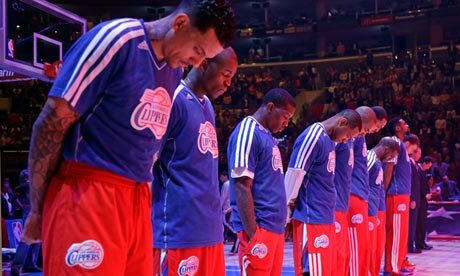 Also taking place at the end of last week was the filing of a lawsuit by Sterling in a California federal court against the NBA for more than $1 billion, pertaining to the league’s decision to ban for life the disgraced Clipper’s owner and force him to sell the team. The lawsuit alleges that the NBA violated Sterling’s constitutional rights when it imposed upon him a lifetime ban, levied a $2.5 million fine, and attempted to terminate his Clipper’s ownership. Sterling claims in the lawsuit that he never violated the NBA’s constitution. He also raises the same issue that Kareem Abdul Jabbar and Mark Cuban publicly voiced concerns over; that the NBA sanctions were based on the recording of a private conversation, which had been obtained without consent. The suit alleges that the league relied solely on the content of a recording that violated California law and constitutional privacy rights. The lawsuit demands that Sterling’s ban and fine be retracted and the termination proceedings ended. Cited in the complaint is a May 22 letter from one of Sterling’s attorneys to the NBA, which authorizes Mrs. Sterling to negotiate the franchise’s sale, with Mr. Sterling agreeing to the sale. The Sterling Family Trust, which is controlled by Sterling and his estranged wife, owns the Clippers. However, Mrs. Sterling made evidently had herself designated the only trustee with sole control of the team. Reportedly, this was done after two neurologists evaluated Mr. Sterling and diagnosed him as being mentally incapable of engaging in day-to-day business. Consequently, the lawsuit disagrees with Mrs. Sterling’s designation of herself as the sole trustee, and it asserts that Mr. Sterling is still a co-trustee who does not want to sell the team. Mr. Sterling may ultimately seek to reinstate his trustee status and may be able to do so via an appeal to the California Probate Court. If the lawsuit goes forward, the case will revolve around the question of Mr. Sterling’s mental state and the extent to which he is in control of the franchise. Sterling’s suit will additionally deal with whether or not the sale of the team is voluntary or has been coerced by the actions of the league. Interestingly, the antitrust claims may be undermined by the agreement between the NBA and Mrs. Sterling in which the termination proceedings were halted and the team was allowed to be sold to Ballmer. It seems a bit curious that, while reportedly having had signed a legal document authorizing his wife to negotiate the sale of the Clippers, Mr. Sterling is now suing to put a stop to the sale. This would mean that whatever amount of money Mr. Sterling theoretically receives under the lawsuit would come from his own trust, if he is not reinstated as a trustee and is deemed to have nullified the agreement. If Mr. and Mrs. Sterling have been working in cooperation, they may just have set up additional leverage, not only to receive a huge monetary windfall, but to also allow for Mr. Sterling to pursue the seemingly unattainable goal of restoring a portion of his tarnished reputation.